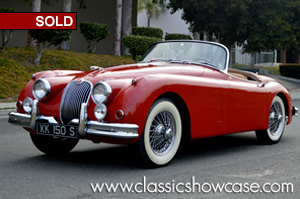 This rare and collectible Jaguar XK-150 S has had limited ownership and is a very solid High-End Driver example. It is a complete matching-numbers car, and in good running and driving condition. The Roadster was previously a part of a large classic car collection, and it's previous owner had the XK-150 S fully reupholstered with the addition of a new fitted Convertible Top, along with (4) new Chrome Wire Wheels and a matching set of new wide Whitewall tires. Further, the Roadster features Overdrive, and has been enhanced by electric power steering, giving an already smooth drive an added touch of control. The Roadster comes in a very attractive color combination of Red over a Biscuit interior, and shows to be rust-free throughout. This is an opportunity to own a highly collectible and rare Jaguar example that you can drive and enjoy today, or take to an ever higher show level if desired. Although the standard XK-150 did not fall short when it came to traditional Jaguar high performance, the expansion of the range with the 150s in coupe, convertible and roadster form gave Jaguar another arrow in their quiver versus the competition, especially in the U.S. market that was so important to their sales. First introduced in 1948, the Jaguar XKs caused a sensation; race car performance on the road, and with an unsurpassed level of sophistication and timeless beauty. During the XK 150 model run (May 1957 through March 1961), a significant engine modification became available, the S engine which featured changes in the head and intake manifold design. Additional changes in the design and structure of the bearings, clutch and flywheel were made in anticipation of the additional torque and wear. The identification-plate engine serial number defined the engine as delivered from the factory. Externally, the S-type models can be identified by an S placed on the passenger door beneath the quarter-window. The XK150S roadster is highly appreciated by collectors who value its combination of luxury and performance with classic XK Jaguar style.